I couldn’t stop thinking about welt pockets, so after consulting about three sewing books from my library, I finally broke down and added them to the back of my already completed wide-leg 1940s denim pants from Simplicity 3688. Welt pockets were so much easier than I thought! I plan to put them in every pair of pants I ever make. My first single-welt pockets! I used vintage buttons and white top-stitching to match details elsewhere on the pants. You can’t tell from this picture, but the pockets are really low. Not stupid low, but pretty low. My books said they shouldn’t cross a dart, and the darts were long. But after my pockets were complete, I examined a few suit jackets in my closet and found that the welt pockets cross right through seams and/or darts! Next time I make these pants, I’ll put the welt at least an inch higher up. I had to use scraps to sew the pocket bags, so they are smaller than they should be. Although I was able to add the pockets after the fact, they would have been more successful had I done them during construction. I examined the single-welt pockets on my husband and son’s khaki pants and found that the top of the pocket bag extends into the waistband seam. I think anchoring them at the top would keep them from sagging, so I’ll try that next time. 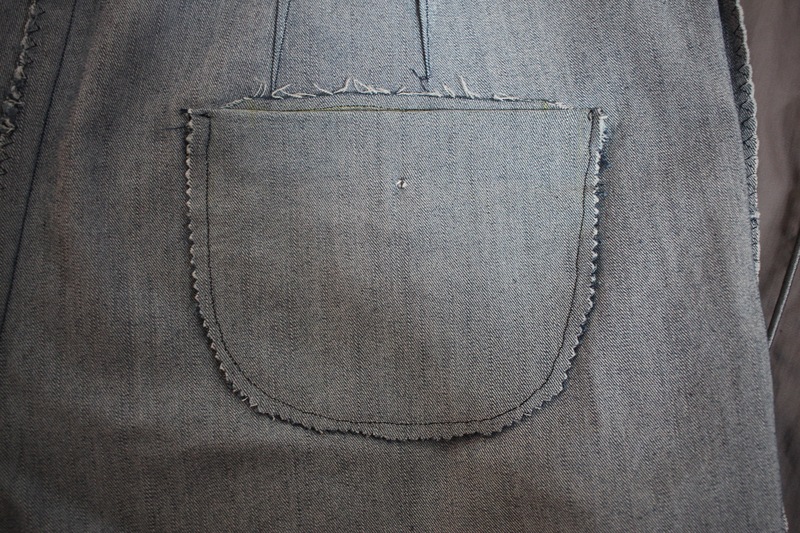 Also, in some of the pants, the sides of the pocket bag were sewn BEFORE it was pulled to the wrong side, then they were sewn again to make French seams. They were very tidy inside. 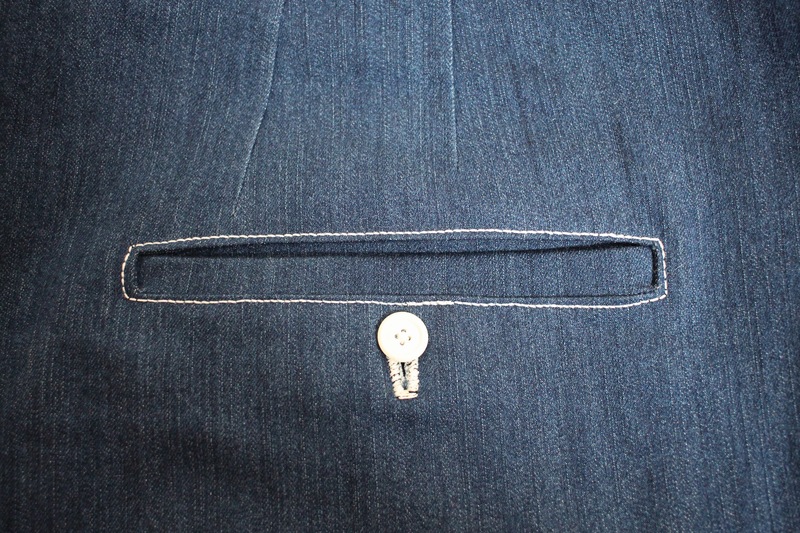 Since I made these, I’ve been noticing all sorts of interesting variations in welt pockets. (Which means I’ve been staring pretty intently at a lot of butts. “Pardon me, I’m not a perv, just a seamstress.”) I’ve seen pocket flaps of various shapes, button loops, and different top-stitching details. Some of these variations will make it into a future pair of pants. But I have several other projects to complete before I can even think about another pair of pants.